Early into my tenure as the pastor of a small church in rural North Carolina, when I was anxious about preaching every week and unsure God would indeed supply the words through the Word from Sunday to Sunday, I received a gift. I received a divine gift, what a friend of mine calls a “God nod.” A God nod is a small, but unmistakable affirmation of God’s presence. As I drove to worship on this particular Sunday, my anxiety level rising as I turned on the final stretch of road to the church, I saw Queen Anne’s lace dotting the side of the highway. The wild flowers had not been there just days before when I’d been on this same stretch headed to Wednesday evening Bible study. Now the lovely, delicate, white weeds were everywhere. I arrived at the church, parked my car, and walked into the sanctuary. In the two vases of flowers on the stands that flanked the pulpit Queen Anne’s Lace overflowed. Another God nod. A God nod, a clear, simple, ordinary and unmistakable assurance of God’s presence and power made known through the weeds of the field along the roadside and arranged in the house of the Lord. You see, the text for the day was one of those seedy parables from Matthew and the sermon was woven together with the image of Queen Anne’s Lace. Queen Anne’s Lace, like the word of God, beautiful, resilient, ubiquitous, not planted nor cultivated by human hands, but undeniably present, abundant, alive and spreading. On that summer morning they were a God nod, assurance that the Spirit was working independent of me, my abilities or my limitations. Each tuft of white blowing in the breeze said, “Trust.” They reminded me that God does provide the words through the Word, made flesh and made known through the lilies of the field, too. I have come to take God nods seriously. I used to brush them off as coincidence or self-fulfilling prophecy or just happenstance. But now, I pay attention. I say, “Thanks for the sign, God.” Instead of what I used to often plead, “God, give me a sign.” I am not as inclined to beg for burning bushes, or voices from the cloud, or talking donkeys, or detailed visions, or explicit instructions in my dreams. Not that such communications from God would be unwelcomed. (Well, actually, given what those communications convey – go to Pharaoh, speak a word of judgment to your own people, take Mary as your wife, I am sending you to Saul now Paul, go eat with Gentiles – maybe they would not be as welcomed as I imagine them to be.) Now I seek to hear and heed the words and Word of God spoken in nods and nudges, simple conversations and chance encounters. I try to remain awake to notes that come at just the right moment, words that keep coming up in various readings, butterflies that suddenly land in my path, and unexpected people who speak wisdom or grace or admonishment. I believe God still speaks in all the ways the Bible reveals: through the divine Other of angels and voices and visions, as well as through others like prophets and preachers and apostles, and, yes, through objects like bushes and donkeys, even. Sometimes we are gifted with a voice from heaven, one we can’t explain but undeniably know is God’s. I have noticed, however, that in Scripture most of the time such experiences aren’t sought out but come more like an ambush. Think of Moses, Mary, and Paul, just to name three. None of them were praying, “Lord, give me a sign.” None of them would have volunteered for the service into which God enlisted them. The burning bush, the angel, the Risen Lord came out of nowhere and hijacked their plans. God still surprises, and yet even an overwhelming word from the Lord requires ongoing communication through the Holy Spirit if we are going to stay the course upon which God has placed us. Moses must convince Pharaoh to let God’s people go and then spend forty years in the wilderness with them long after the flames on the bush have been extinguished. Mary must travel with Joseph, raise Jesus and survive the sword that will pierce her soul once Gabriel has left the building. Paul has journeys and imprisonment and all manner of hardship ahead as soon as Christ returns to the right hand of God. Dreams and visions and angels and flames and wind and talking clouds may well give us our marching orders but we need the daily God nods to keep us moving forward on the Way. Through the Word made flesh, Jesus Christ, and the gift of the Holy Spirit, the Advocate, who teaches, reminds, guides and protects, the revelation of God is never far from us. If we don’t receive the sign we think we are seeking we are assured that we will find Jesus in the Bible, through prayer, during worship, and with one another around the Lord’s Table. If we wish for a still small voice but hear nothing, we can rest in the silence, trusting that Christ prays for us and the Spirit intercedes for us even as the communion of the Saints surrounds us. If we are struggling with a sense of God’s presence and power we might not plead for a sign but instead pay attention and thank God for the ones made manifest in the ordinary. We talked a while longer and I contributed to help him get some new clothes. As I headed back and prepared to preach I sent up a thank you for Joseph and for our encounter and for the God nod, too, once again keenly aware that the Word of the Lord comes to us in countless forms, every day. Mercifully, even when we aren’t paying attention. 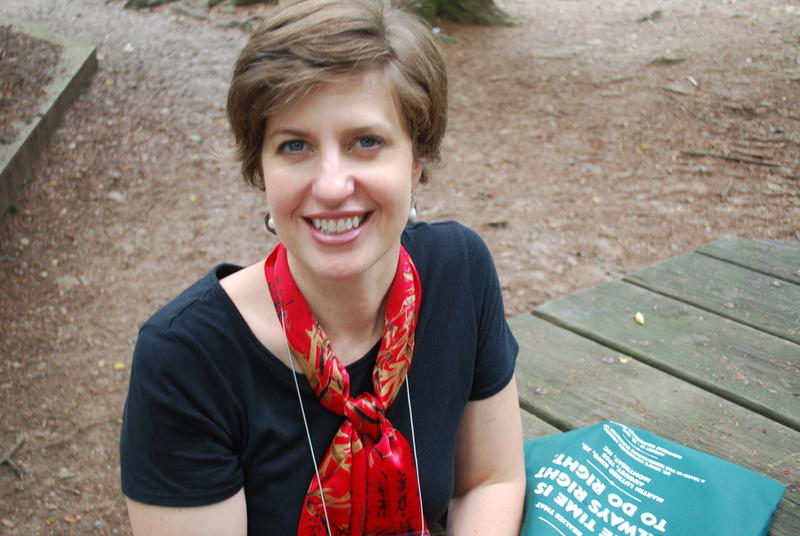 Jill Duffield was ordained a teaching elder in 1998 and served large and small Presbyterian congregations until 2015 when she became the editor/publisher of The Presbyterian Outlook, an independent bi-weekly publication on the Presbyterian Church (USA). The Advocate is exploring ways we in the church tell our stories. Jill Duffield starts us off with this reflection on God speaking to us. Look for more articles to come on social media, church communications, and testimony in worship.